If you’ve ever encountered a debt collector, you know how unnerving the experience can be. At best, it’s frustrating, but at its worst debt collection can be an intimidating and shameful process. There are many nuances in the industry too that leave consumers confused about their rights and which actions they should take. We’ve written before about some of this, such as the zombie debt that plagues old accounts and the debt buying industry that auctions off accounts over the Internet. 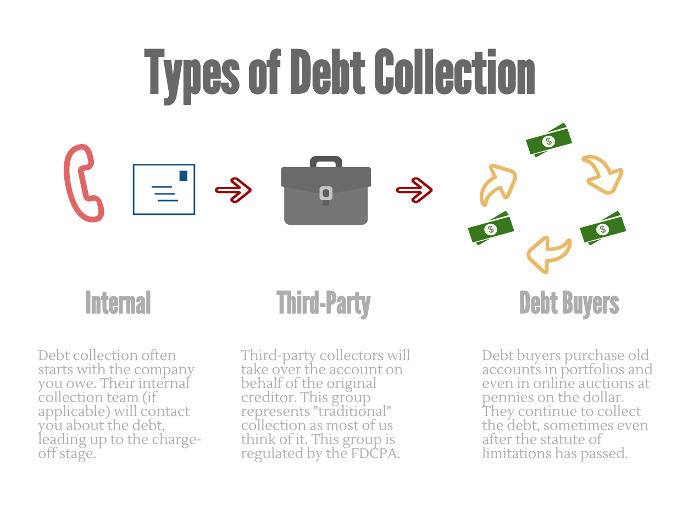 Today, we want to provide even more clarification about the debt collection industry by covering the different types of debt collectors consumers should expect to encounter. Internal debt collectors are those who work for the same company that you owe. They are sometimes also called “first-party” collectors. Internal collection is a streamlined process for the company, as they don’t have to sell the account or contract it out to a third party. In short, they can maintain more profitability. At the same time, though, they may not be willing to devote resources to this collection effort indefinitely. So, even though an internal collections process might be used early on, that does not mean that the account won’t later be given to a third party. Internal collections can be tricky in a few ways. One of those ways is that the term “collections” can be used prematurely. When we think of collection, we think of accounts that are seriously past due, to the point that they have already been reported to the credit bureaus. This would typically occur after 90 days, when you become “delinquent.” And the next step, a charge-off, occurs after either 120 or 180 days. For medical accounts, the process might take longer, as that system can sometimes be more forgiving. In either case, an “Internal Collections” title might be used as a subtle intimidation tactic. When you see “collections” on a bill, you are much more likely to take action, out of fear that you will get in further trouble and have the issue reported. In a way, this is smart on behalf of the creditor because it increases the chances that you get paid. When will an overdue account be reported to the credit bureaus? Why am I receiving collection letters? To clarify, my late account has not currently been reported to the credit bureaus, and this is an internal collection group that is employed by your company? If you find yourself in a situation similar to mine, understand that you don’t need to put yourself in a tight financial situation unnecessarily. For instance, in my case I was given seven months to pay the bill before it would be reported. It may make sense in these cases to hold off on making the payment, so that you can keep more money on hand for other emergencies, etc. Just be sure that you do get the payment in before it’s reported as late, and double check your credit report to ensure accuracy. Another issue with internal collections is that they are not regulated by the Fair Debt Collection Practices Act. This means that they have a little more wiggle room in the way they pursue communication with you. Ironically, this doesn’t necessarily mean that they will be more rude or invasive than other collectors. Since they are representing their company, there may be a customer service element to their approach, and they might work even harder to be respectable toward you. Your experience may vary here. This group represents traditional debt collection as most of us think about the term. These collectors are working on behalf of your original creditor in order to get their money back. They typically take over your account once it has reached the charge-off stage. Usually, they work on a fee structure, based on getting you to repay the creditor. If they are unsuccessful, they don’t get paid. They have not purchased the debt outright, but instead make a percentage (somewhere around 50 percent) of how much you repay. This group is subject to the rules of the Fair Debt Collection Practices Act. While they are regulated, you will likely find them less friendly than an internal collection group, because they aren’t really reflecting the original creditor’s business, and don’t have the same level of customer service or “brand integrity” to maintain. When collection attempts have failed there is either a lawsuit for the debt or the debt is sold. The groups that buy these accounts are called “debt buyers” (no surprise there). Debt buying doesn’t stop after one round. The accounts will pass hands repeatedly, bouncing from buyer to buyer. They also aren’t typically sold as individual accounts. Instead, they are bundled into portfolios, and they are even sold in online auctions. We covered this in our post about the debt collection underworld, so check that out for more information. One important thing to keep in mind is that because of the system, debt buyers might purchase accounts that are very old. On top of this, they might be given bad information along the way. This creates a real mess, and if you aren’t careful you might put yourself in financial danger. It’s important that you understand the statutes of limitation in your state and how they apply to any old accounts that might be in your name. On top of this, you need to make sure that the information regarding the debt is accurate, and that you aren’t being hounded for something that actually belongs to someone else. These old accounts are frequently referred to as zombie debt, so be sure to stay informed so that you aren’t left with a frightening financial nightmare. At the end of the day, any form of debt collection can frustrate us as consumers. You want to protect your privacy and your rights, and the constant calls can be unbearable. Hopefully, you are now better informed about the types of debt collectors that hassle consumers and you have some tips for handling each kind. If you are currently dealing with collection agencies, be sure to learn more about our debt management program and how it can help the calls stop today. Our program gives you a structured repayment plan without the hassles and phone calls.